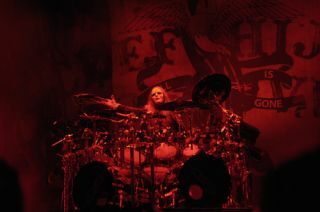 Joey Jordison has described winning Rhythm's Greatest Drummer Of The Last 25 Years poll as bigger than scooping a Grammy with Slipknot. It's fair to say that the diminutive sticksman, who took top spot in our MusicRadar.com poll with 37 percent of the votes, was pretty pleased with his win. He said: "I'm at a loss for words. To my friends and fans across the world, thank you, this is beyond unbelievable! Something like this reminds me everyday why I continue to do this. "It's because of all of you that I'm very passionate and still love what I do. My fans continue to push me, if I didn't have them I wouldn't be where I'm at today. "This is bigger than a Grammy to me! You people keep me alive, I can't thank all of you enough. To all the Rhythm staff, thank you, you are amazing! Thank you to my family, friends, all the amazing drummers I was in company with, without them I wouldn't be here either and last but not least, all my brothers in Slipknot! Thank you all again!" Joey took top spot in the poll, with Mike Portnoy (Dream Theater) and Gavin Harrison (Porcupine Tree) completing the top three. For the full rundown check out our 20 Greatest Drummers Of The Last 25 Years gallery. For all of the latest drumming news, interviews and reviews pick up the latest issue of Rhythm, which features Travis Barker, Korn's Ray Luizer and a whole load more. You can order a copy from www.myfavouritemagazines.co.uk.